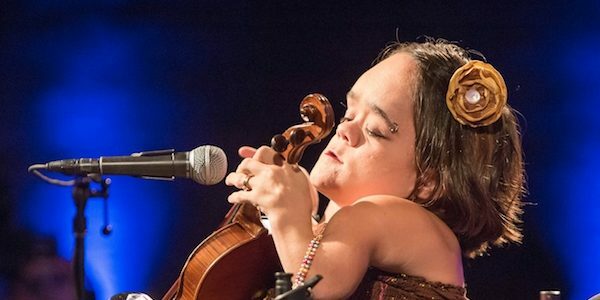 It’s our great honour and pleasure to present to you our latest artist spotlight, with the incredibly talented, Gaelynn Lea. S] What are you up to today? We are rehearsing today for the show with The Tap Tap in Prague… it’s happening tonight! Then tomorrow we fly to London! S] What drives your passion outside of music – think people, places and things? I love connecting with people and problem-solving. I think that’s why I am drawn to advocacy – I am passionate about disability rights, environmentalism, and sustainable agriculture. I also love to read about spirituality and psychology. In my free time I most enjoy camping, reading, gardening and spending time with friends and family. I wrote this song for my husband – about six weeks before our wedding I needed to have an unexpected major surgery and afterwards there ended up being complications. The situation was getting pretty scary but Paul stayed with me the whole time and was very comforting through the whole ordeal. The experience reminded me that love is beautiful even when it’s difficult. In a somewhat abstract way, “Someday We’ll Linger in the Sun” is about this experience. S] What have been some career highlights for you so far? Over the years, many different shows have felt magical – for this I am extremely grateful – but it is hard for me to pick out highlights. Alan Sparhawk and I played our first Homegrown Music Festival in Duluth as The Murder of Crows back in 2012 at a big cathedral called Sacred Heart…. That show was very special – it was one of my first larger performances where I sang my own songs. After I won NPR Music’s Tiny Desk Contest, my husband and I went on a five city tour sponsored by NPR and it was our first experience with national performing – that was a great experience. It was my first time to Washington DC and New York City – I got bit by the travel bug during that tour! The newest highlight is that we are overseas! I was asked to join the Czech band The Tap Tap on a few songs for their St. Nicholas Day concert and that sparked a tour of sorts. We just got in yesterday and we will be overseas for 13 total days, including three shows opening for Low. S] How did your first real “big break” in music happen? Back in January 2016 I entered NPR Music’s Tiny Desk Contest because several fiddle students encouraged me to submit a video. My friend Leah helped me tape my song, “Someday We’ll Linger in the Sun” in my lesson studio. Much to my amazement, out of 6,000 contestants, I was announced the winner on March 3, 2016. After that, I started getting offers to play farther from home. I started working with a booking agent to book at national tour. That is definitely the moment that my music career began to accelerate. S] Can you remember the experiences and emotions you went through when you first picked up an instrument, can you talk me through that? I first started playing the violin at age 9, after hearing a full orchestra. My first experience listening to the strings was very powerful. I decided I wanted to play in orchestra someday. The next year, I had a chance to join an orchestra, but it required some adaptation of the instrument. That is why I play my violin upright like a tiny cello. This was a really exciting time for me. The more I practiced, my dedication grew. S] What would you say your biggest challenges are on a day-to-day basis? Because of the fact that I use an electric wheelchair, accessibility is always a concern of mine. Often venues do not have accessible stages and this means that five or six people have to lift my wheelchair on stage or that I must play my set from the floor. It would be nice if venues were more accessible and it’s something I would like to see improve in the future. I need day to day assistance to travel, so the only way this tour is feasible is if I have a travel companion. I’m very lucky right now because my husband has been able to take a leave of absence from his job. 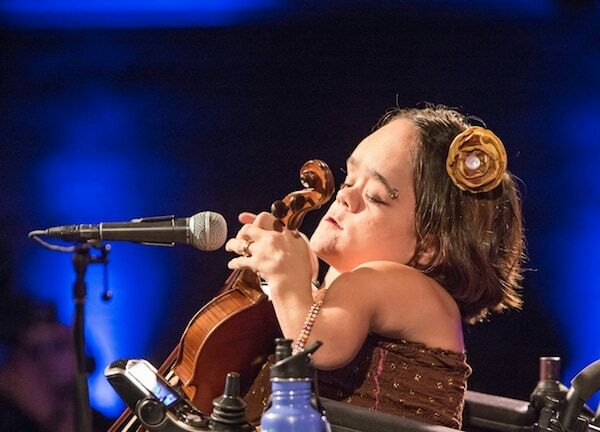 S] What advice would you give to emerging musicians who have various challenges, and disabilities to overcome? My personal belief is that the more people see performers with disabilities, the more they will make it a priority to make venues accessible. So get out and play whenever possible and don’t be afraid to speak up for what you need, even if don’t get what you need right away. Change isn’t immediate but it will happen eventually if we are persistently raising awareness. S] How was Pigface 25? It was so fun! It was their 25th anniversary show and so it was a pretty big deal for them! We had so much fun – the band, crew, and audience were all so excited for that show! The members of Pigface are some of the most welcoming people I have ever met. I played a cover of their song “Point Blank” and it went well… I enjoyed interpreting their music in a new way. S] What are your plans as we approach 2017? 2016 certainly exceeded expectations, so who knows what 2017 has in store? I am planning to continue touring the US through May, and in June I am taking a few weeks off to start writing more music. I would love to return to Europe at some point and I hope to release another full-length album in 2018. I am mostly just trying to work hard, and enjoy the ride!